It would be nice if drivers objected more often. In harness racing, driver objections are so rare that they tend to make news whenever one does occur. Unlike their thoroughbred counterparts in which jockey objections are a daily occurrence, nearly all reviews of possible race infractions in harness racing are initiated only by the judges. All of which makes a recent objection at Plainridge Park unique. In Tuesday’s 10th race nightcap (replay available here), a driver’s objection was not only lodged, but was allowed by the judges and it resulted in the elevation of the second-place finisher to first. Here’s what happened. In the race, Nicholas Graffam drove the 4-year-old gelding Mic Woodrow. Sent off at odds of 7-2, Graffam – the fifth leading driver at Plainridge this year by both wins and earnings – moved his horse Mic Woodrow first over prior to the half-mile mark. Mic Woodrow engaged the race favorite and leader See Me Streakin nearing three-quarters, but flattened and then backed away around the final turn. In the stretch, Mic Woodrow didn’t lose any more ground but remained a constant one to two lengths behind the same leader. With about 10 yards left to go and the race seemingly decided, See Me Streakin veered over a path to the outside causing interference to Mic Woodrow which led him to go off-stride. What then ensued was the announcement of an inquiry with Mic Woodrow being the subject of the inquiry due to the break, but the graphic on the screen showed both an inquiry and objection. Within a minute it was announced that the inquiry sign was being taken down on the toteboard and that the focus was now the objection. In less than two minutes the judges took down See Me Streakin and placed Mic Woodrow first. I don’t know what was more surprising: The fact that an objection was lodged to begin with, or that a decision was made to change the placings as quickly as it was. It was a borderline call that I think you could argue either way. Yes, there was clear interference but it seems almost impossible to think that Mic Woodrow would have won regardless. The more important point is that Graffam should be commended for initiating the objection to begin with. He obviously felt something wrong had occurred and he made the decision to force the issue himself. In the process he wasn’t just taking a stand for himself, but for the horse’s connections and the bettors who had interest in the horse. Aside from this occurrence and other rare instances, there seldom exists a driver’s objection. Marcus Miller – one of the sport’s higher-regarded drivers – wrote on Twitter previously that objections aren’t put in because drivers can’t win them. He cited three times he’s tried where the infraction’s looked seemingly obvious, but all three times the objections were disallowed. While this could be part of it, the overarching explanation is that harness racing has become a gentleman’s game, which, of course, speaks to an even larger issue. The same type of courtesy that drivers extend to one another on the track such as needlessly giving tucks, opening lanes or just generally playing nice for other drivers extends post-race. There’s an unwritten rule that it’s bad form for drivers to object to a race result. The prevailing industry mentality doesn’t make sense. Despite the friendly nature of harness races, most drivers are fiercely competitive. If there is a perceived wrongdoing, why defer to judges to see if an issue should be considered? Like all of us, judges are far from infallible. It’s not realistic to expect that they’re going to be able to pick up every possible nuance in a race. Not to mention, the drivers are the ones in the middle of the action and are more well-positioned to note if a possible infraction takes place. Above all of this, drivers should have an obligation to object to a result if they feel a violation has occurred. With tens of thousands or even hundreds of thousands of dollars bet on a race, drivers have an obligation to help ensure the integrity of the results. I get it that in today’s racing bettors aren’t as necessary to the sport as they used to be, and as such aren’t protected as they should be. 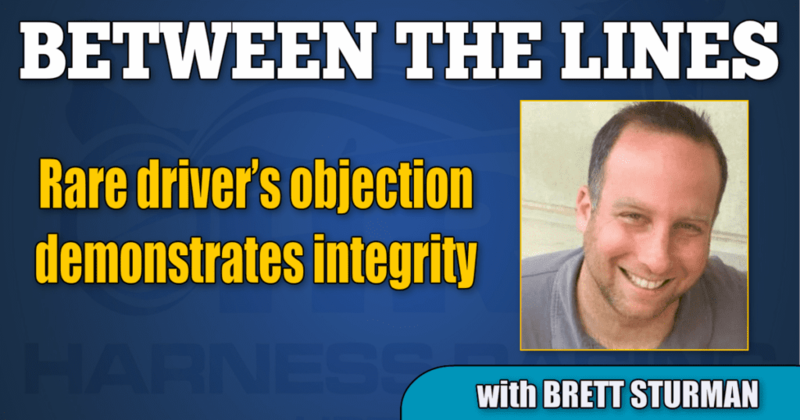 But trainers and owners have a vested interest in the results as well, and you would think that their interests should mean enough to drivers to file an objection if a possible wrongdoing has occurred. Much can be taken from the successful Graffam objection at Plainridge. Though it occurred at one of the lesser-followed tracks, drivers from other colonies should take note. The industry will be better off when it’s not frowned upon for drivers to let it be known if they object.